$295.00 In stock - low quantity. Order in the next 14 hours, 7 minutes and it will go out today! If you're a family entertainer looking for a big, colorful trick filled with a couple of comedic mishaps and a startling "How-did-that-happen?" surprise finish, take a moment to read about Comedy Jumbo Card in Balloon. Yes, there have been many versions of this funny trick, but this one is the classic, created many years ago and reformulated here with sure-fire workmanship. You have a spectator choose a card and share it with the audience. If you like, you can use your favorite method to make it vanish. At AmazeKids, we like the Super Giant Devil's Hank to vanish larger objects. Then you show a tray to which are attached, three big colorful balloons. You proclaim, "I'm going to make your card reappear inside the balloon you choose." Now the hilarity begins. Before the color is chosen, one of the balloons becomes suddenly flies off the tray, hissing wildly into the air. You feign embarrassment, and claim that now the card will appear in one of two balloons that the spectator chooses. This time, as if on command, another balloon begins to deflate until it's airless. Undeterred, you say the magic word and the last balloon explodes, the selected jumbo card in appearing in its place. 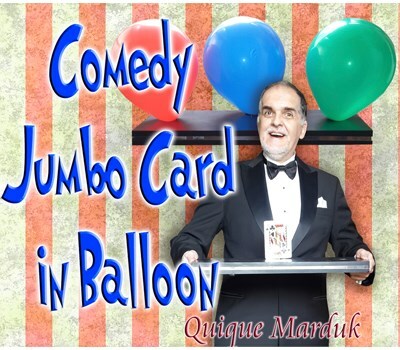 The Comedy Jumbo Card In Balloon is a first rate product for magicians looking to add strong visual gags to their magic. The succession of funny balloon gags, which are under your control at all times, will be a hit at your kid shows, your family shows, even your adult shows if you can pull this off in character. You get the special wooden tray, 12 colored balloons, 2 gimmicked jumbo playing cards, and an instructional DVD with routines in both English and Spanish. Get the Comedy Jumbo Card in Balloon and let the hilarity begin!